One of the oldest games that has been played for decades is the lottery. It exists in some form in every part of the world and has the potential of making people millionaires. Over the years, there have been numerous changes made to the lottery, but the basic concept has remained the same. There are have been tons of winners who were living normal, ordinary lives and a win transformed their lives completely. Some people have been lucky enough to have won the lottery several times whereas others have had to play for years before they were able to take home a prize. Sure, some players do tend to go crazy with their winnings, but there are others who have made good and positive changes to their lives. 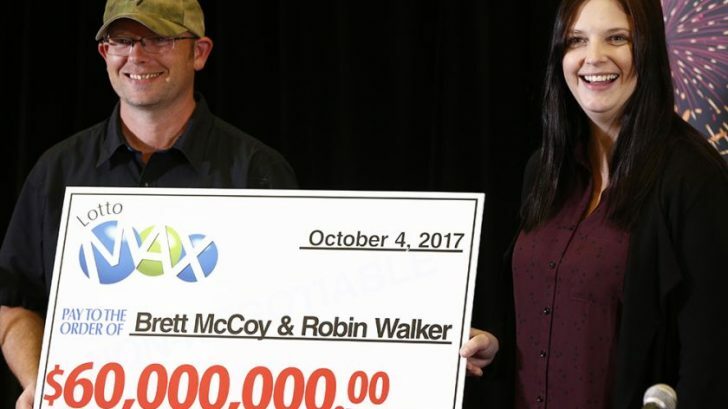 An Alberta couple won $60 million, which was the biggest lottery jackpot in the province’s history, but they chose to remain patient when it came to their winnings. They said they were going to let their win sink in before they made any plans for using the money. The only thing they did buy immediately was a brand new truck. Robin Walker stated that they had purchased the truck so they could use it for going to claim their prize. 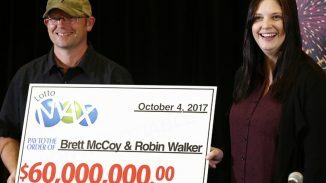 On September 22nd, 2017 Walker had bought the Quick Pick Lotto Max ticket, which cost $11, with Brett McCoy. The purchase had been made in the hamlet of Peers from McLeod Trading Post. The couple from Yellowhead County went back to the same store the next day to pick up some treats for Walker’s four kids and some chicken feed for their hobby farm. When Robin scanned her ticket in the store, numbers popped onto the screen and she just couldn’t believe her eyes. She thought she had made the mistake so she scanned her ticket again and the result was the same. That’s when she ran outside to tell Brett that they had won $60,000. The store clerk followed Robin and told her to count the zeroes again. When she claimed her check for $60 million, Robin admitted that it was still unbelievable to them. She said that her four kids, who are between the age group of 4 and 16, have come up with some ‘ridiculous’ plans for the money, Robin said that they were going to pay their winnings forward. She said that they already had everything and now they have money too. Robin asserted that a sum like that brought a lot of responsibility with it because it could benefit a lot of people. However, McCoy added that they planned to use some of the winnings for expanding their farm. He was laughing when he said that Robin could now buy all the chickens she wanted. Walker referred to herself and McCoy as blue-collar Albertans and she said that like other everyday people, they had been playing the lotto all their life. They were asked if they would continue to purchase lottery tickets in the future and Walker didn’t hesitate in responding positively. She stated that buying them now would be even more exciting. Located 180 Kilometers west of Edmonton, the small hamlet of Peers only has a population of 120 people. But, it seems as if the place is definitely good for lottery players. An $8.2 million prize was awarded to a couple in Peers in 2005 and an $11 million jackpot was claimed by another resident two years later. Another couple also saw their life change, thanks to their decision to buy a ticket for the Lotto 6/49 lottery game in Canada. Robert Donaldson was going on a trip to China. Before he left, he requested his wife to clean up after their dog in his absence and to buy a ticket in the lottery. According to Donaldson, his wife Sandra neglected to do the pet-cleaning duties, but he couldn’t blame her because she had picked up the lottery ticket he asked and it made then richer by $23 million. The new millionaires reside in Smithville, Ontario and it Sandra’s decision to change their usual routine that got them the prize. She revealed that her husband always opted to choose lottery numbers, but this time she had decided to go with the Quick Pick option instead. The switch turned out to a good decision for the two of them. A retired personal support worker, Sandra realized that she had a ticket that matched the winning numbers. She decided to go to the store in order to confirm if the couple had indeed won the jackpot. However, even though she had made the confirmation, she didn’t reveal it to her husband immediately. Instead, she waited a week for him to return from China and then shared the good news with him. A retired manager at Dofasco, a steel company based in Hamilton, Ontario, Donaldson couldn’t believe how his wife chose to surprise him when he got home. Sandra told him that she had good news and bad news to give him. She told him the good news first, which was that he could buy a new car sooner that he thought and the bad news was that they had to see their lawyer immediately. After delivering this news, Sandra handed her husband their winning ticket. He was just speechless and couldn’t process the news. When asked about their plans regarding their winnings, the couple said that they were going to share their prize with their two children and two grandchildren. Robert and Sandra also said that they were going to put in a pool at their house, build a walk-in closet and get themselves a new car, just like Robert had wanted to do before they won. Suffice it to say, the lottery changed the lives of these two couples and all for the better because they were able to handle their big win with a cool head. They didn’t spend their winnings all in one go and were able to fulfill the dreams they had had.